Hyperikon's new low profile LED Panels provide for a great replacement for old fluorescent fixtures. The new LED Panel lights comply with all state- and federal regulations, and are therefore ideal for installation in public facilities, such as schools or hospitals. The uniform lighting provided by the LED panels enriches the surroundings and creates a more pleasant environment regardless of application. This panel is also available in a 24V DC variation, which is ideal for solar powered lighting configurations. Available in an exclusive 277V dimming model 0-10V. • TRUSTED BRAND: Hyperikon is an American brand that is recognized for it's quality and durability. Whether installed as pendant or in a drop-ceiling, these panels will enhance its environment with bright state-of-the-art LED lighting. ✔ DIMMABLE - Hyperikon's modern grid ceiling led is dimmable and free from flickering/buzzing. Adjust the brightness smoothly throughout the day for proper mood and increase productivity. Stay focused for longer periods without causing eyestrain or headaches. 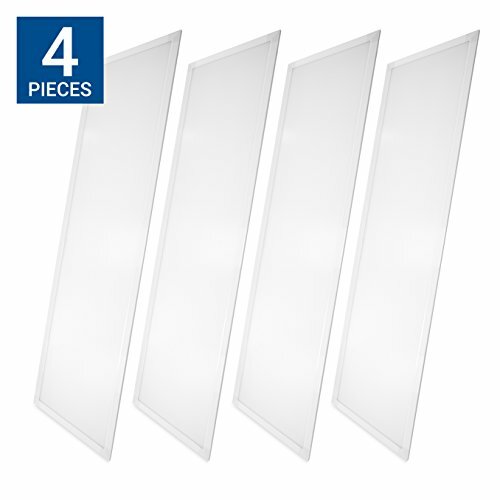 ✔ EDGE-LIT - The ultra-thin design on these led panels makes it a lightweight ceiling fixture. Edge-lit troffer panels has the led source located on the sides of the panel which illuminates dark spots/corners and provides a more pleasant light distribution. ✔ UL & DLC - This product meets the applicable safety standard by UL for energy efficiency performance. Hyperikon's led panel is also qualified by Design Lights Consortium (DLC) and therefore eligible for rebate programs. ✔ SAVE ENERGY - Save 75% instantly when you replace your old 200w fluorescent light fixtures with led troffer panels. With an incredible light output of 125lm/w and 45,000+ hours lifespan (15 years based on 8h/day usage), you are making a smarter decision for your home and the environment.